Acouple of weeks ago I went to BMDC (Bangladesh Medical and Dental Council) to get a certificate of good standing on behalf of my maternal uncle, who is presently an Australian resident and a Medical Practitioner. My uncle nominated me to issue the certificate from BMDC since he had to post the certificate to a medical authority in Australia for official reasons. I met one of the officers at BMDC and told him the urgency of the certificate. He then wanted me to provide him with some necessary papers, which are legally needed as evidence. I returned home that day and went back there (BMDC) the following day along with the required documents. The strange thing was that when I asked the officer how much it would cost to withdraw the certificate, he started computing numbers and amounts on a paper and forwarded it to me. I was completely dumbfounded when I saw that he demanded Tk 4070 instead of the standard government rate Tk 3000. The extra is for the staff, he said without which I would not be able to get my work done. I was ashamed to pay the extra to this well-educated 'gentleman' and more so when he began to bargain after I paid him Tk 70 less. Finally I got rid of him paying him his amount in full and got the certificate of good standing. What a hassle! It is disgraceful to say that bribery in Bangladesh has turned out to be a compulsory part of official business and work. After much rambling and plodding, at the Trade Fair 2006, I stopped to take a moment's rest. Subsequently, I noticed that a boy of hardly six or seven dropped the packet of chips he was carrying. The child could be excused, but what infuriated me was that his mother, seeing everything, did not even take the initiative to drop the packet in the dustbin which was hardly six feet away. I hate littering and this provoked me, and I promptly dropped the packet in the dustbin. This small matter later forced me to conclude that we are hypocrites. We blame the politicians of being devoid of patriotism; however, do we the citizens of this country take any step to bring a change? No, we do not. Instead, we sit back and wait for those egotistic politicians to do everything. Let us bring a change in our very own ways, no matter how small it may happen to be. 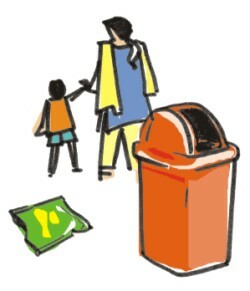 One of the basic requirements of staying healthy is to maintain cleanliness as much as possible and stay away from filthy areas on the street. This is what we have been learning ever since we were little. The other day, however, while I was walking by Segun Bagicha, passing by a government high-rise, a bin filled with rotten vegetables, paper and other equally filthy objects were thrown from a balcony on a floor above. They landed on the people passing by, street sellers and many others. Though the victims had to try their best to save themselves from such an unforeseen event, it was in vain. This is not at all expected, especially in a residential area.